Thomas Jefferson wasn’t from Kentucky. Then again, neither was Sam Houston. But that hasn’t stopped one Kentucky-based distiller from naming its creations after these two celebrated Americans. Jefferson’s Reserve sells for as little as $35 and as much as $50. It is, according to its handsome, knob-topped bottle, “very old.” I’m told as much as 50% of each barrel evaporates during the 15-year aging process. Jefferson’s Reserve has a light, yellow-tinted color in the glass (as opposed to more of a reddish copper tone in the bottle). Good legs. Notes of pear, vanilla, and butterscotch make for an inviting nose that’s sweet and lacking in alcohol tinge. The taste is a bit bolder than expected, though still on the subtle side of most bourbons and therefore remarkably easy to sip. Fronted by tangy hickory and citrus, the profile is set against a background of classic bourbon flavors: syrup, sweet corn, and dry oak. The finish is light and watery at first, only to ramp up a few seconds later with a long, peppery finale. While such contrasts make for a versatile pairing partner, mild- to medium-bodied cigars are the best complements. 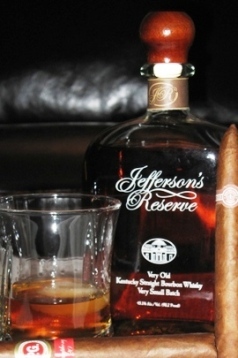 Try the H. Upmann Signature, Illusione Epernay, and La Caya Cameroon on for size. I don’t know for sure, but I’d imagine these are the cigars Thomas Jefferson would choose to pair with his eponymous bourbon.